Lazy eye and squints are common eye problems for children. Both conditions are treatable, but may be difficult to detect, especially squints, so it is important to take your child for regular eye tests. You may not be able to detect a squint just by looking at the eyes. Some people think that if the child’s eyes look unusual or the two eyes look different they have a squint, but this is not necessarily the case. Older children may complain of double vision. 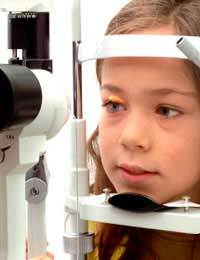 All children under 16 and those under 19 who are still in full-time education are entitled to a free NHS sight test. Lazy eye, often known as amblyopia, is a condition where one eye works independently from the other eye. The problem is with the brain cells controlling the eyes rather than the eye itself. The most common types of lazy eye are known as strabismic and anisometropic. Strabismic amblyopia is caused when a there is a squint in one eye which means that the eyes are not aligned correctly. The brain prefers to use one eye over the other so that one eye is not stimulated, making it weaker. The brain cells controlling this eye do not develop properly and the eye remains weak. Anisometropia refers to the condition where one eye may be short sighted and the other eye is long sighted. The brain cannot make sense of the different distances so it finds it easier to use only one eye. A lazy eye can also be caused by cataracts or because of an accident or trauma to the eye. In most cases a lazy eye can be treated but it is vital that the condition is detected early to prevent any permanent damage. Treatment aims to re-train the brain to use the non-preferred or weaker eye. Using an eye patch on the good eye is one of the most common methods to treat this. If the lazy eye is a result of long or short sightedness then glasses can be prescribed which will re-balance the eyes’ focus. If there is also a cataract in the eye then surgery may be required to treat the cataract first, before the lazy eye can be treated. A squint is a condition where the eye turns inwards or outwards and sometimes up or downwards. This turning occurs when the muscles of the eyes are not correctly balanced, when there are faulty nerve signals to the eye and when the eye cannot focus. Subsequently the eyes cannot work properly together and it will become difficult to see clearly. The medical name for a squint is strabismus. Some babies are born with a squint. The most common age for a child to develop a squint is between ten months and two years but it can occur up to the age of five years. It is not always known what causes squint but there is often a family history of squints. When a baby is born with a squint, this is known as a congenital squint and it is caused by the muscles of the eye being at fault. Long sightedness can also be a cause of squint. Long sightedness is a condition where it is difficult to see objects close up. If this is left untreated and glasses are not prescribed to correct the long sightedness then a squint could develop. The eyes over compensate and the brain may automatically respond by switching off the image in one eye and turning the eye to avoid using it. In some cases a squint develops as a result of a childhood illness such as measles or chicken pox. There may already have been a tendency to squint but before the illness the child was able to keep his or her eye straight. It could also be caused by an illness which has damaged the nerve. Squints can easily be treated but as with most eye conditions the earlier it is treated the better. If it is left untreated it can lead to permanent sight problems, however it is never too late to treat the squint. There are different types of treatment available depending on the type of squint, ranging from eye drops to surgery. Glasses can be used where the squint is a result of long sightedness. An eye patch can be worn on the good eye to encourage the weaker eye to be used and to strengthen the muscles in this weaker eye. Some types of squint can be treated with special eye drops. For congenital squints surgery may be performed and this can be undertaken on children as young as three months old.